How are you folks? I know it's so hot around but it;s time for some freebies! WordPress 3.6 has been released this week and it's popularity is still growing. As a most popular content management system, WordPress has also a solid directory of themes, that will fit any niche. You can show your content in a very elegant way with low or no budget required, so today I give you a list of ten great free WordPress themes. You can also check other free WordPress themes lists on 87studios. So, here is the list of 10 best free WordPress themes for August 2013. Oceanus is a free premium WordPress theme. 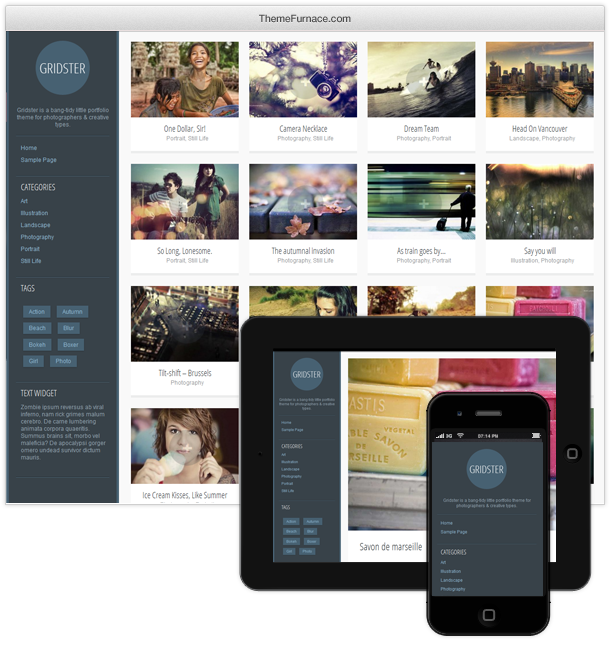 This is a WordPress 3+ ready theme with features like custom menu, featured images, widgetized sidebar etc. Theme also comes with an option panel. The homepage of the theme has a customizable jQuery content slider. Magazino is a simple and flexible theme ideally suited to magazine style blogs. It is responsive to browser size so should look good on any screen. It supports all the usual WordPress features like custom menus and widgets, and also makes it easy to customize with your own logo and you can set the main color scheme to any color you want with the built in color picker. Mesocolumn is a blog, magazine, community and ecommerce theme for WordPress. You can choose a blog style layout or featured category magazine grid layout for homepage. The Theme is built with semantic HTML5 and CSS3 for modern browser. With the responsive layout, it will look good in any mobile device such as android phone, iphone or ipad. On top of that, the theme also support popular community WordPress plugin, BuddyPress and popular ecommerce WordPress plugin, WooCommerce. Need to setup forums? No worry, the theme also support WordPress Forums plugin, BBPpress. Travelify WordPress theme design is inspired by nature. We made it as simple as possible while fully customizable with several Theme Options and page templates. Travelify is ideal choice for travel blogs, green thinking, adventurists and anyone who is looking for an amazing and simple way to share pictures. Luminus is a beautiful and great looking free WordPress theme from WPEden. This is a fully responsive theme meaning it will look perfect in any devices. It is built with the twitter bootstrap framework and comes with features such as extensive theme options, responsive design, 3 page templates and much more. Ameyso is the first free fully best free responsive wordpress theme from chrisamdesigns. This theme got a beautiful slider which is powered by flex slider. Totally Ameyso got a simple,beautiful,elegant design. Time is a new elegant free responsive WordPress theme from Site5. Time comes with a minimalist, clean design with simplicity in mind. With this theme you can display large photos, writing informative content or presenting other creative material the best way possible. The Time theme includes features such as theme options, custom menu, widget ready, Google web fonts supported, built-in pagination, jQuery PrettyPhoto lightbox plus much more. If you looking for a clean and elegant theme, then this is a theme for you! TBLOG is a fully responsive – fluid WordPress theme for personal bloggers, furniture showcase sites, portfolio style websites. You can Built without clutter and with a custom design its an amazing solution for either small portfolio websites or as a starter theme for a more amazing theme. If you don't want to miss new free WordPress themes lists, subscribe to our newsletter in the box below post or in sidebar! I'm glad you like it Sergey! Great collection, Kris. These are definitely some great themes, my personal favorite is Surfarama. I love Gridster but can't figure out how to get a blog as a home page. Any suggestions for someone who's new to this? I don't get where is your problem, I've sent you direct email.